It was nothing the markets weren't expecting - but the rouble still fell again. It’s a cold old winter in Russia right now, with western sanctions and low oil prices squeezing the economy, and it ain’t getting warmer after its sovereign debt was downgraded to ‘junk’ status by Standard & Poor’s. The downgrade had been widely predicted, but that didn’t stop the battered rouble falling yet again against the dollar. Russian bonds are now rated BB+, the same level as Bulgaria and Indonesia. Many investment funds are not allowed to hold junk debt, but there hasn’t been a massive sell-off just yet as Moody’s and Fitch still rate Russia as investment grade – just – after both demoting it to one level above junk earlier this month. The rouble still took a beating yesterday, ending the day 6.6% higher at 68.8 to the dollar. It had recovered somewhat to 67.8 this morning, but all of the gains from the central bank’s intervention to prop up the currency in December have been wiped out in the last month. Meanwhile, an index of Russia’s 50 most-traded stocks fell some 2% yesterday, although it was in black by a hair’s breadth this morning. Government bond yields (which move in the opposite direction to price) also jumped - the yield on a 2023 bond is now almost 3.5% higher than an index of emerging market debt, according to Bloomberg. 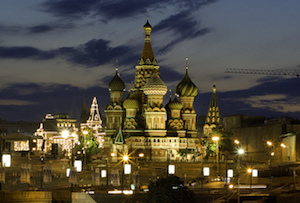 In short, Russia’s economy is in the proverbial – although we knew that already. It has been strangled by western sanctions over its support for Ukrainian rebels, and may be in line for yet more after fighting intensified. The real killer, though, has been falling oil prices. Russia can’t balance its budget with $105 (£70) oil and the central bank said its economy could shrink 4.5% this year if it was $60. A barrel of Brent Crude is now worth less than $48. The most urgent issue for the Kremlin (other than keeping Putin in power, obvs) is how on earth Russian companies are going to pay the $120bn due this year on its increasingly pricey foreign debt. Even without sanctions limiting the west’s dealings with them they would struggle to refinance it, given their credit ratings move in step with their government’s. The Central Bank drained its foreign currency reserves by a quarter last year, according to the FT. Don’t be surprised if the remaining $379bn shrinks even further when it inevitably has to intervene to prop up a creaking corporate.